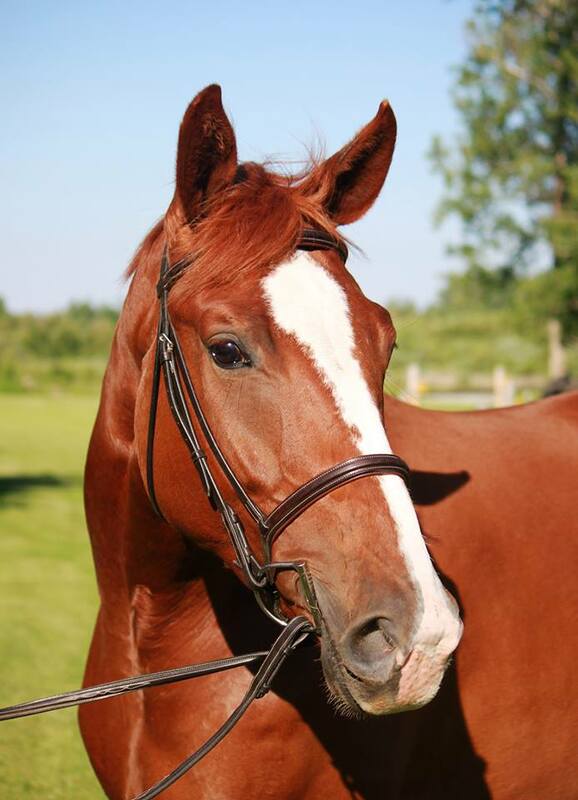 Gloria WSH 2011 Hanoverian Mare - Sold! Gloria is an elegant, correct and flashy mare by Glorioso Noir, born on June 16/11. 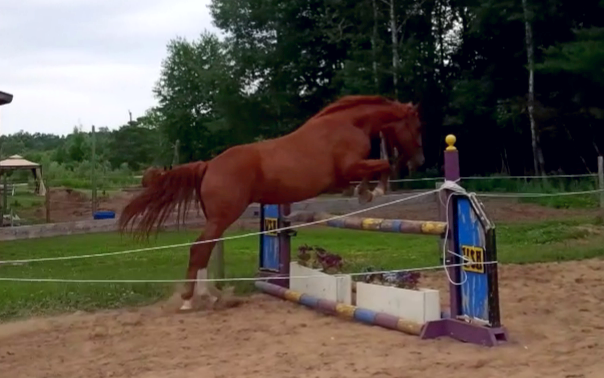 This mare is very tall and leggy, she is well balanced and has gorgeous elastic movement. Gloria is a branded and registered Hanoverian with a German passport. She was started as a 3 year old and is going beautifully under saddle. She stands quietly for grooming, ties, lunges, and has been long lined. She has been free jumped and is brave, and shows excellent form with tight knees and a lot of scope. 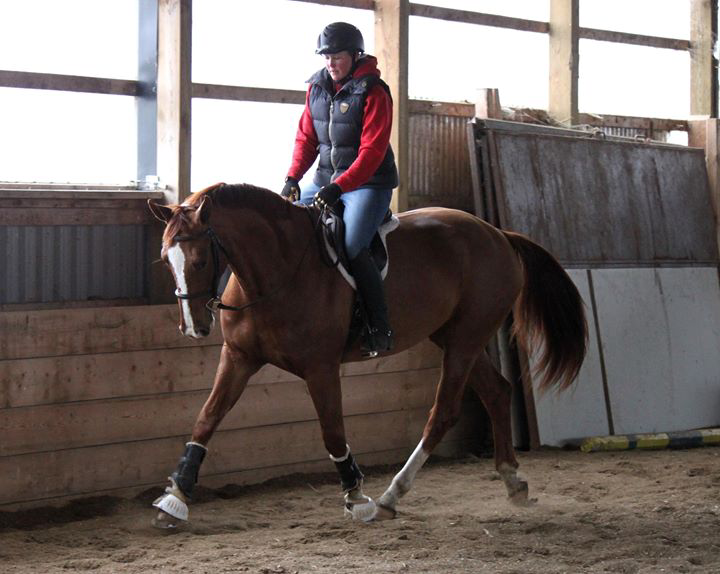 Gloria has been lightly started jumping under saddle and shows great consistent form, including professional training for 30 days, with the trainer commenting she would be a suitable 3'6" hunter or derby horse. 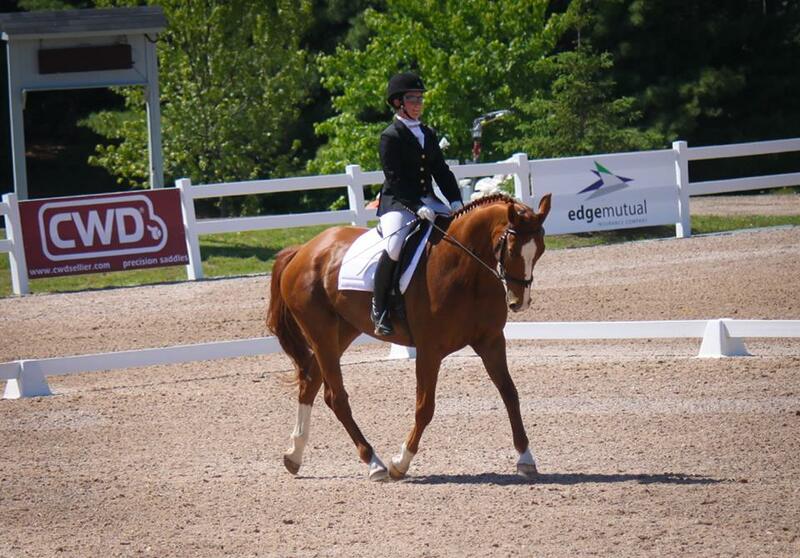 Gloria is currently in professional dressage training, confirmed training level finishing Reserve Champion at her first Gold Dressage show at the Caledon Equestrian Park in Palgrave, and scores up to 68% in her first season showing. 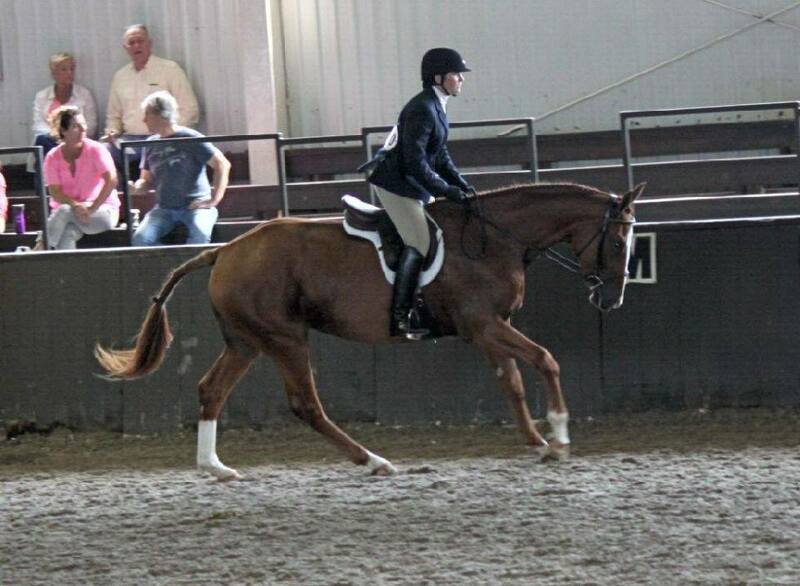 She handled the large and stressful venue really well, and was able to stay focused in the ring. 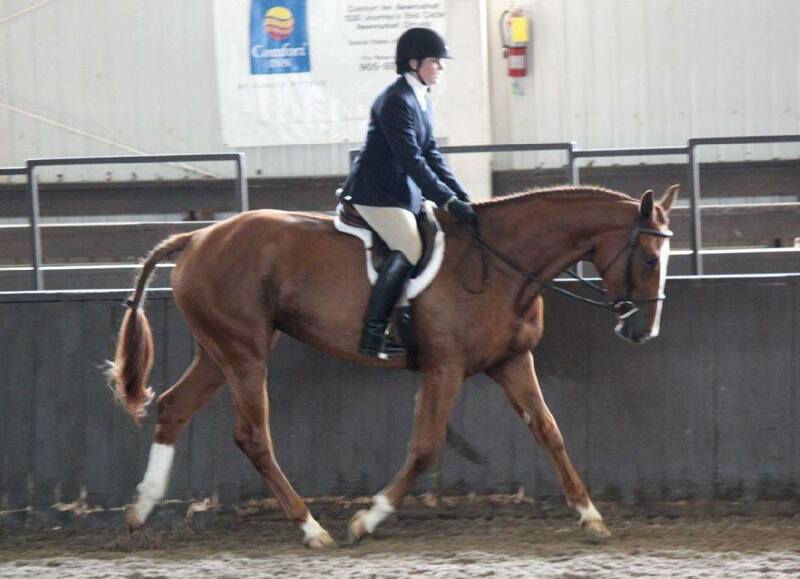 This mare is truly versatile and athletic, she could be either a dressage horse, or a hunter/jumper. 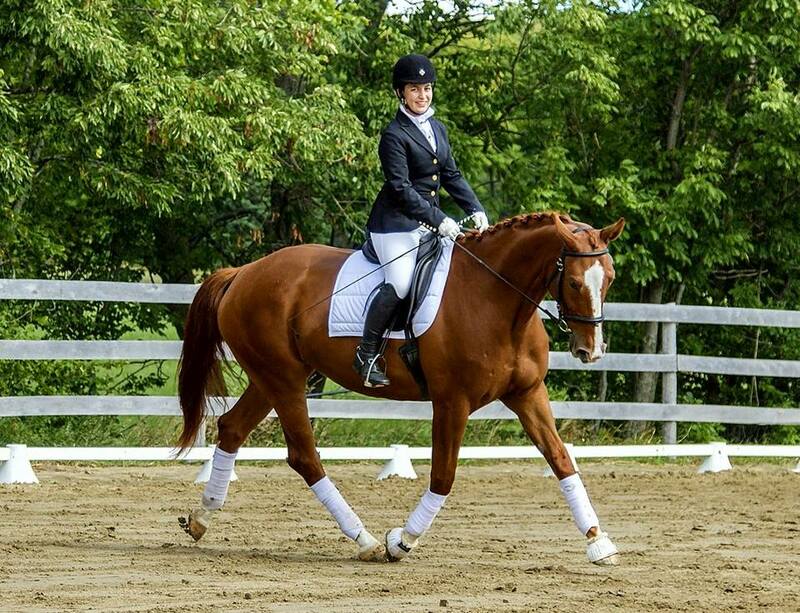 Gloria is suitable for an ambitious amateur rider in a professional program. 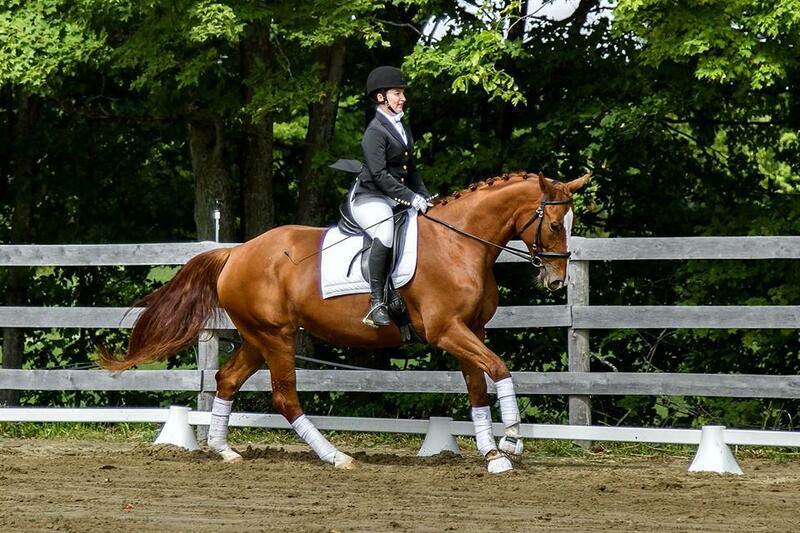 She will continue in dressage training until sold, and is considered a hunter/jumper prospect as she is not regularly being jumped at the moment. As a 3 year old Gloria finished 3rd in the prestigious Lieutenant Governors Cup Class at the 2014 Royal Agricultural Winter Fair! 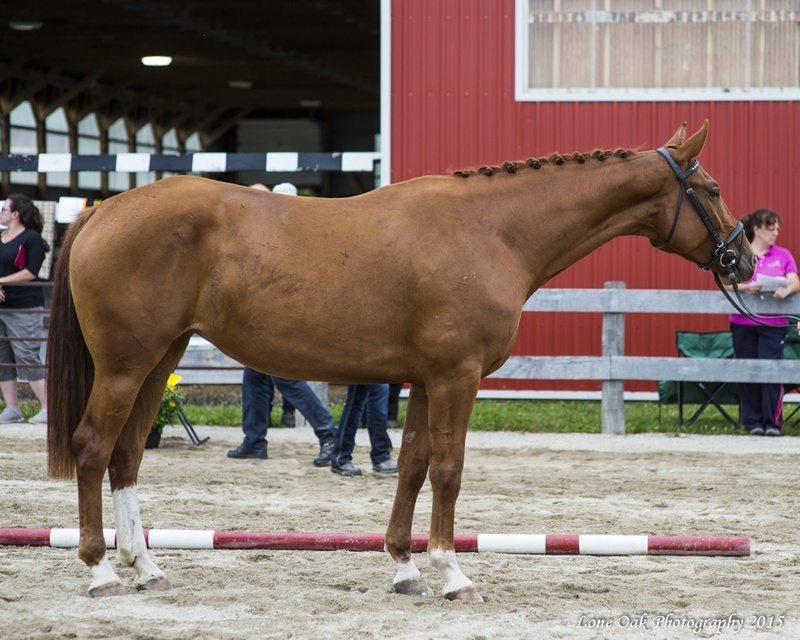 This class is a hack class for up and coming 3 year old Canadian bred horses, and has 2 competitions to select the top 20 horses to compete at the Royal. What an accomplishment for this beautiful mare who was up against a very competitive group of 22 of the top qualified Canadian sport horse prospects! We couldn't be more thrilled with Gloria's results and her behavior while showing at the Royal, a very overwhelming environment for such a young horse, but she handled it like a pro. 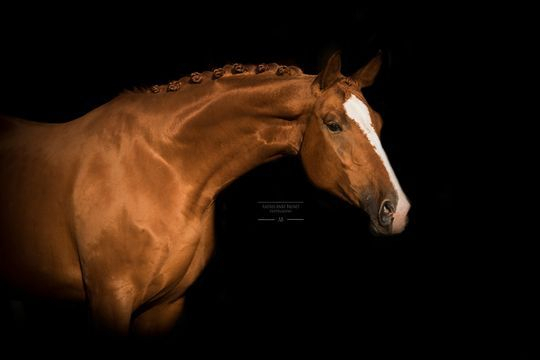 Gloria is also now approved for breeding and is entered into the main stud book with the Hanoverian Verband. Gloria does not have any vices. UTD on vaccines, farrier work, deworming and teeth. 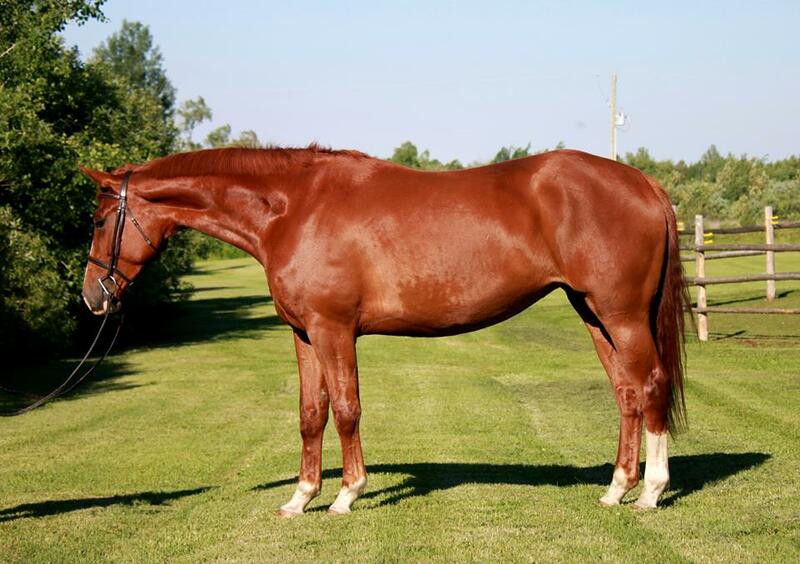 Gloria's dam Monika is an AHS main stud book mare. She is a big bodied mare who has produced many athletic foals. 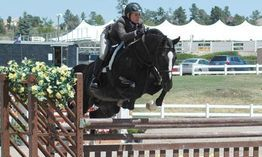 Her sire Merlin is a very versatile stallion who has produced successful offspring in the dressage, hunter, jumper and eventing disciplines. The photos of Merlin below are during his stallion testing and in the jumper ring being competed by Chris Pratt. Standing at 17 h, Gloria is a big bodied mare with substantial bone. Sold!! 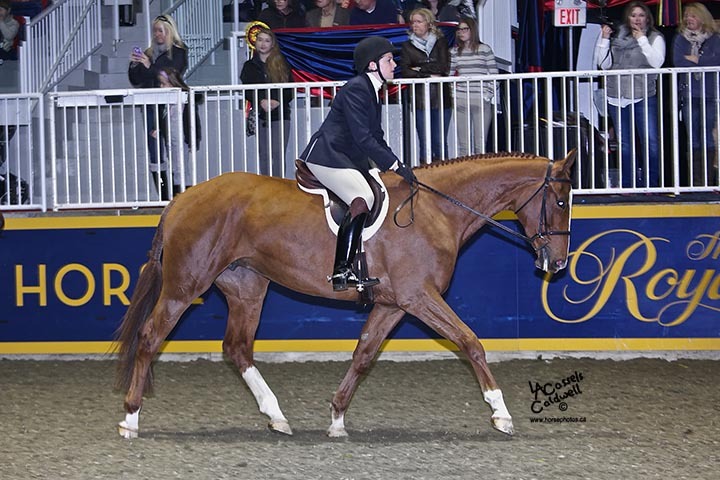 Congratulations to Heather and Margie Heberle of Heberle Stables for the purchase of Gloria to develop her into a national level hunter with the goal of her being a derby horse! 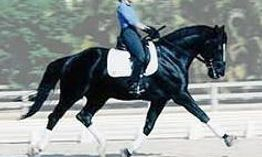 Gloria is by Glorioso Noir, the gorgeous 17.2h black Hanoverian stallion, pictured above. During his stallion licensing in Germany, Glorioso placed equally well in jumping and dressage. Among the highlights of his scores were an 8.0 on character, temperament and willingness to work and constitution. 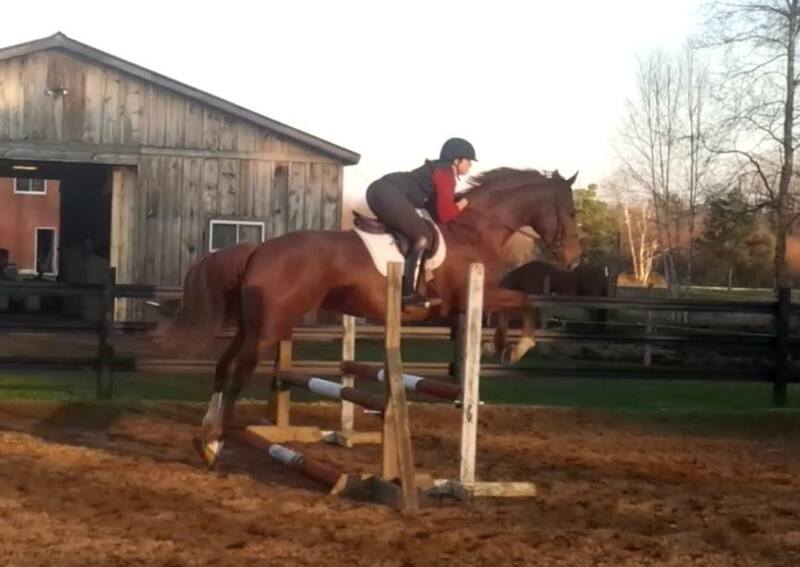 He also received an 8.0 on jumping ability and an 8.0 on his trot. 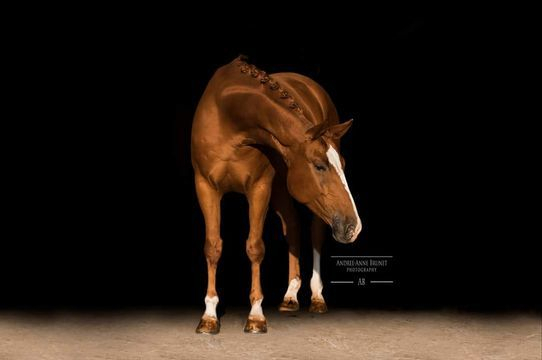 Glorioso was the 2007 Champion working hunter for the American Hanoverian Society. His sire, Glorieux, won the Bundeschampionat and was the winner of his stallion licensing. Glorieux is by the immortal Goldstern. Gliorioso's damsire is the legendary Grundstein I. His dam, Grosse Liebe is the mother of three other licensed sons. Her dam, Luna, produced 7 licensed stallions including Landkoenig and Grundsteins Erbe, who was sold to Italy for DM 450, 000 as a jumper. Glorioso is approved by the AHS, VhW, CSHA, and ISR.